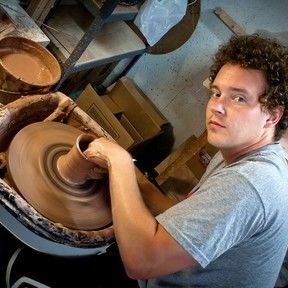 I know that I'm alive when I sit at the pottery wheel and throw pots. This design features an image of hands throwing clay on the pottery wheel and dark text which shows up well on lighter shirt colors. This t-shirt is everything you've dreamed of and more. It feels soft and lightweight, with the right amount of stretch. It's comfortable and flattering for both men and women. • 100% combed and ring-spun cotton (heather colors contain polyester) • Fabric weight: 4.2 oz (142 g/m2) • Shoulder-to-shoulder taping • Side-seamed Model is wearing a size M. He's 6.2 feet (190 cm) tall, chest circumference 37.7" (96 cm), waist circumference 33.4" (85 cm).